The Extreme Gone Mainstream: Commercialisation and Far Right Youth Culture in Germany. Cynthia Miller-Idriss. Princeton University Press. 2018. In The Extreme Gone Mainstream: Commercialisation and Far Right Youth Culture in Germany, Cynthia Miller-Idriss investigates how the fashionable, and often sophisticated, brands worn by far-right groups and individuals are coded with extremist messages. While this is by no means a new phenomenon – the Nazis marketed a line of Hitler-themed kitsch, after all – the seemingly conscious move away from the skinhead aesthetic associated with the movement poses a challenge to countries like Germany that have spent decades rebuilding their democratic institutions following the end of World War Two. Unsurprisingly, Nazi and neo-Nazi iconography, as well as Holocaust denial, is illegal in Germany. The German Constitutional Court has the power to ban extremist political parties if they are deemed to pose a significant threat to democratic order and clothing brands with coded messages are often banned in schools. Yet, as Miller-Idriss observes, the messages found on items sold by clothing brands such as Thor Steinar rely upon consumers’ prior knowledge of far-right ideologies, with individuals subsequently becoming the ‘literal embodiment’ of extremist messages. The author argues that the popularity of such brands in Germany has coincided with ‘significant waves’ of far-right mobilisation across Europe that have a vested interest in recruiting young people. Encompassing tenets of grounded theory, the methodological approach of the author involved both the amassing of historical and contemporary imagery and the conducting of interviews with young people in two vocational schools with a history of student far-right extremism in Berlin. The benefit of these interviews speaks for itself, particularly as participants are at a stage in their lives when both their individual and collective identities are still developing. The digital archive compiled by Miller-Idriss gives her research a dynamic edge and facilitates the analysis of these images through an interdisciplinary lens, covering religious iconography, art history and German nationalist history, to name but three examples. Proving useful to both general readers and researchers alike, Miller-Idriss also provides a comprehensive methodological appendix in which she further explains her multi-faceted approach. An empirical analysis such as this, the author suggests, encourages us to recognise the constitutive power of clothing and how it should be taken more seriously as an ‘economic object’. Clothing can be a powerful socio-economic status symbol and is often loaded with hidden meaning. History has shown us the potent power of symbols, and those worn by far-right youth Germany today find their origins in myths that reflect what Miller-Idriss terms the ‘fantasy’ of Nordic heritage: for example, clothing from Thor Steinar’s Viking Division line features an emblem that looks like a Rune – seemingly innocuous at first glance. These myths, however fantastical, have inspired both scholarly and cultural productions: the author notes Richard Wagner, Friedrich Nietzsche and Ferdinand de Saussure as three widely-known examples. The gods, heroes and creatures of Wagner’s Der Ring des Nibelungen (The Ring of the Nibelung), for example, are drawn from Norse mythology. Such myths, and their enduring appeal, are largely underexplored within the relevant academic literature, but, as Miller-Idriss asserts throughout, an understanding of their historical origins is an essential component of contemporary investigations into how such motifs are utilised by the far right in Germany today. Following Roland Barthes, Miller-Idriss notes that myths have a dual purpose: they help us to understand the world around us, but simultaneously impose that understanding upon us. Subsequently, they are a way in which ‘sacred narratives’ can be evoked; such narratives tend to revolve around a nation’s history and people. Nazi propaganda, for example, commonly invoked nineteenth-century myths surrounding das Volk (‘the people’) in order to construct a sense of German national identity that emphasised a more ‘traditional’ way of life, as well as perpetuating a gendered binary regarding the place of men and women in society. This binary is reflected upon further in Chapter Six, ‘Soldier, Sailor, Rebel, Rule-Breaker: Embodying Extremism’, which effectively illustrates how male bodies in particular have become part of a mythic cultural ideal entangled with notions of nationalism and hegemonic masculinity. Miller-Idriss describes how early nationalist ideals identified masculinity as an integral part of national identity and, subsequently, national dominance. The Nazi ‘cult of the body’ – effectively demonstrated by Leni Riefenstahl’s propaganda film for the 1936 Olympics, Triumph des Willens (Triumph of the Will) – was embedded in everyday practices as well as encouraged through state-sanctioned violence. This idealisation of the masculine body centred on male strength and physicality as well as playing on the masculinist ‘desire’ for male comradery and a way to vent frustration at mainstream society. The author makes the case that it is crucial to understand how bodies themselves are sites through which nations and national identities are constructed, reinforced and performed; this, she argues, is evident through national dress, dance and other physical embodiments of nationhood. The participants interviewed for this research were predominantly young men (only two participants were female), and Miller-Idriss posits that their clothing choices act as a ‘performative screen’, requiring both an idealised physicality as well as an extremist worldview. Having spent most of their lives embedded in social contexts that place value on traditional notions of masculinity, participants’ responses when shown images of extremist commercial products arguably reflect this immersion: words such as ‘brutal’, ‘tough’, ‘violent’ and ‘hard’ were particularly prevalent in their descriptions. Interviewee ‘Timo’ approved of images of men who looked ‘ready to be violent’ vis-a-vis their clothing and physique, while ‘Hayri’ describes working out over the winter months in order to let his masculine body be seen by others during the summer with the help of particular branded clothing. While an investigation into the fashion habits of the far right might at first glance seem inconsequential to broader political realities, Miller-Idriss’s analysis gives us a valuable insight into how young people in this movement position themselves, how this reflects the normative functions and beliefs of the far right as well as how young people consolidate their political identity. Future research could potentially relocate its analysis out of the capital and into the deindustrialised cities and towns of the former German Democratic Republic (GDR), as well as investigate women’s engagement with this hyper-masculine movement. 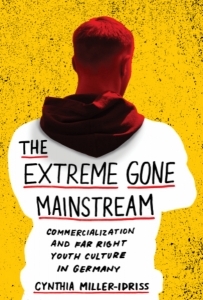 The Extreme Gone Mainstream provides readers with an excellent insight into an increasingly complex social phenomenon. It effectively unpacks the mythic history behind the coded clothing worn by far-right youth in Germany and also explores a number of important issues such as the intersections of masculinity and nationalism and the engagement of far-right youth with material culture. The analysis presented in this book will doubtless prove invaluable to any future research given the ever-changing dynamics of far-right mobilisation across Germany and beyond. Katherine Williams is an ESRC-funded PhD candidate at Cardiff University. Her research interests include the role of women in far-right groups, feminist methodologies and political theory and gender in IR. You can follow her on Twitter: @phdkat. Read more by Katherine Williams.